NEWLY RENOVATED - Just Steps To The Beach And Heated Pool! Master bedroom with new king size bed, mattress, and bedding. Second bedroom with two new twin beds, mattresses, and bedding. 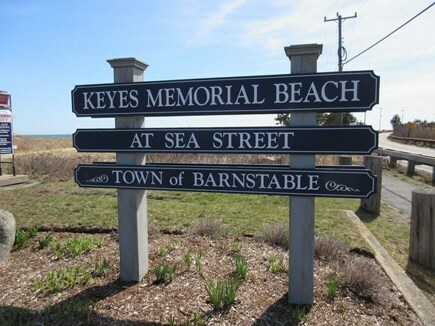 Beautiful Keyes Beach is just steps (1/10 mile) away! LABOR DAY SPECIAL. 8 Nights for Price of 7. Includes FULL Labor Day Weekend (Tuesday Checkout). ONLY ONE FULL SUMMER WEEK REMAINING. MONDAY AUGUST 26th - MONDAY SEPTEMBER 2nd WITH LATE CHECKOUT! ONLY $1,700 INCLUDES FULL LABOR DAY WEEKEND! 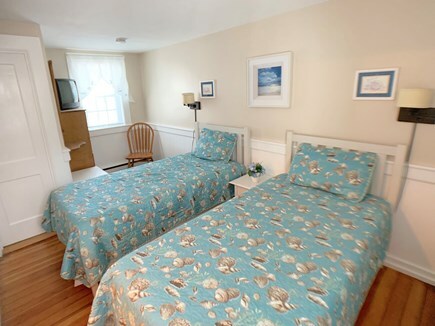 You come to the Cape for the beach … so why not stay just steps away? 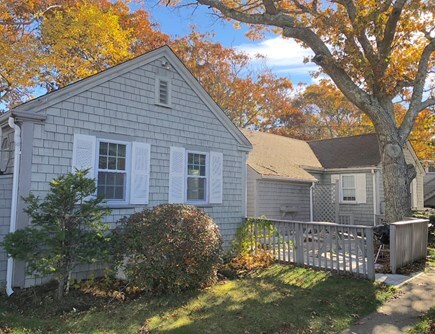 This charming two bedroom one bath cottage on a quiet cul-de-sac is just steps from Keyes Memorial Beach. It sleeps up to 6 on 1 king, 2 twins and 1 queen pull-out sleeper sofa. The perfect location for enjoying the beach, shopping, dining, or simply getting some well deserved rest and relaxation. Upon entry, the first thing you'll notice is the cathedral ceiling which opens up the bright airy living space where we have carried the feel of the Cape into and throughout the cottage. 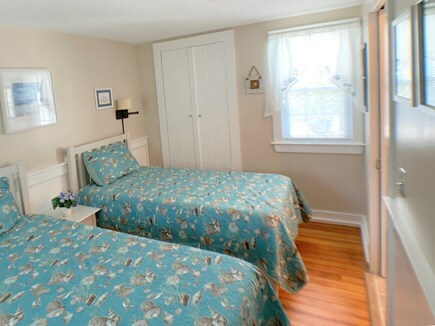 The Jack & Jill bathroom can be accessed from either bedroom and towels and linens are provided. The fully equipped kitchen makes home meal preparation practical, efficient, and affordable. Whether grabbing a quick bowl of cereal for breakfast at the kitchen table, or enjoying steaks grilled to perfection on your own private patio, this cottage will be your vacation home away from home. For those who prefer fine dining, the restaurants and activities of historic downtown Hyannis are just a mile away. 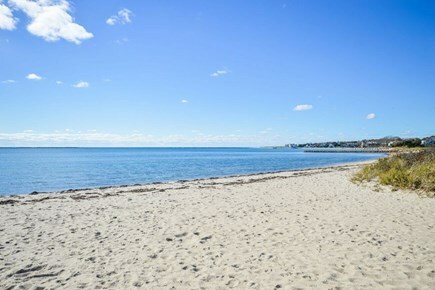 Centrally situated on Cape Cod it is ideal for day trips anywhere on the Cape all the way up to Provincetown. The ferries to Martha’s Vineyard or Nantucket are also close by. 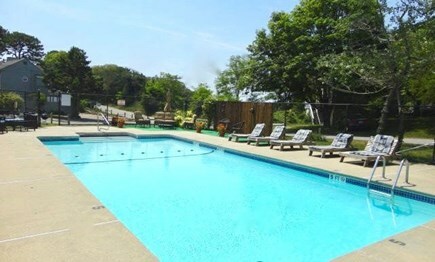 This vacation home has many extras from an in-ground heated pool (seasonal), to strong WiFi to help you stay connected, and a dedicated parking space. We’re sure you will love your time here and want to return year after year. Long-Term Rental (1 month or more): Off season monthly rentals are available November 1st - March 31st. Contact owner for details. Estimated price range $2,000 - $2,500/m. Additional pricing info: $100 Cleaning Fee Per Stay. State and local taxes of 14.45% will apply. We spent a long weekend at this newly renovated cottage. What a great place to relax and enjoy our time. The beach was so close and well maintained. I look forward to returning in the summer to really enjoy the beach. 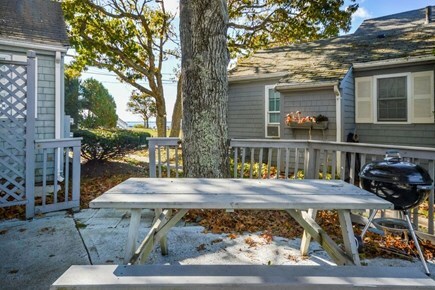 The patio is a great place to sit under the shade tree enjoying a glass of wine while looking at the ocean.